I’ve been wanting to make cake pops every since I first learned about them. I kept putting them off thinking they were way to difficult. But I finally did them yesterday, and they weren’t nearly as hard as I once feared, that is along as you follow the directions. I used my basic doctored up cake box mix recipe, with added pudding mix and and extra egg to make it very moist. So the cake pops weren’t so sweet, I used cream cheese instead of frosting in the crumbled cake, and then dipped them in white almond bark. I lucked out and found some white cake mix for the fourth of July with red and blue sprinkles. You can do the exact same thing with white cake mix though by adding some red and blue oblong or Jimmie sprinkles to the mix. I tried several shortcuts on these, and nothing worked. Everything that Bakerella says is a must step. You have to let the cake completely cool before crumbling, or your crumbles will be too big and will lead to your pops falling apart. Then after forming your cake balls you also must place them in the freezer. They will fall apart every time if you don’t. You can freeze them for 15 – 30 minutes. If you let them freeze solid, you can’t get the lollipop stick in without breaking them. Next when dipping in the candy coating, make sure to slightly turn and ever so gently tap off the excess. Being too rough on this step will also lead to disaster too. In the end, they was a little bit of a learning curve to making these, but they aren’t terribly hard. With a little assistance my three year old dipped one successfully. They aren’t nearly as hard as I thought, but they do require several steps. 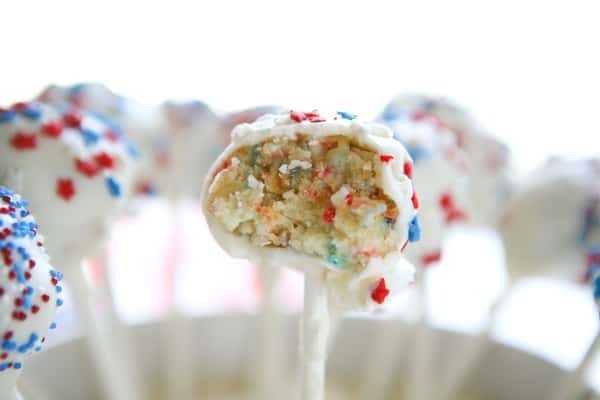 I know I am not artistic enough to pull off some of the amazing creations Bakerella does, but at least I have some sprinkle covered cake pops that are cute as well as tasty. Follow package directions on cake mix, adding 1 package vanilla pudding mix and 1 egg white. Cook as directed in a 9 x 13 pan. Let cake cool. Slightly warm cream cheese in microwave. Add to a large bowl. Crumble cake in bowl and mix until cake and cream cheese is well mixed. Form cake balls in hands and place on a cookie sheet. Place in freezer for at least 15 minutes. Melt almond bark. Place lollipop stick in almond bark, insert in cake ball and dip in almond bark. Very gently tap and turn cake pop to remove excess. While still wet, sprinkle with red and blue sprinkles. Place in Styrofoam to dry. For instructions from the cake pop expert Bakerella herself, please follow the link below to a very informative video. For an instructional video how to from the cake pop expert Bakerella, please watch her video here on Amazon. Is this your first time making them? And your pictures are so clean and wonderful! what camera do you use? So pretty! Your so sweet, thanks! This was my first time. My camera I recently upgraded to an older Canon 5d, and a 24-70 canon lens, after I broke my 3rd little 50mm 1.8. Soooo very cute! How did you get them to stand up and what did you place them in? I need something to take to a cookout Monday and I think these would be great! Just not sure how to serve them. I forgot to mention that, they are standing in a bowl of rice. You would have to arrange them in the bowl of rice once you got to the party though. I don’t think the rice would hold them up during transport. wow yuor pops looks beautiful!!! wow your pops looks beautiful!!! These are adorable, Angie. They look like mini fireworks. It would be neat to try to get stripes on them. I love how the colors work together. These are adorable!! What a great way to celebrate! I was wondering what size box of vanilla pudding, and if you use the instant or the box that you have to boil? I used the small box of vanilla pudding you cook. But I have used instant pudding in the past too, and it also works. Is it 3oz cream cheese pkg or 8oz? Sorry about that, the 8oz package of cream cheese. I keep wanting to make cake pops too! These are so nice & patriotic!! I’m glad you had success because I want to try making these too! After a long day at work, it was refreshing to come and visit your blog. I hope you are having a good start to your week. Much love and many hugs from Austin! Thank you for sharing your creative concoctions with me. Those are darling! And I love the photos! So ethereal & fresh! 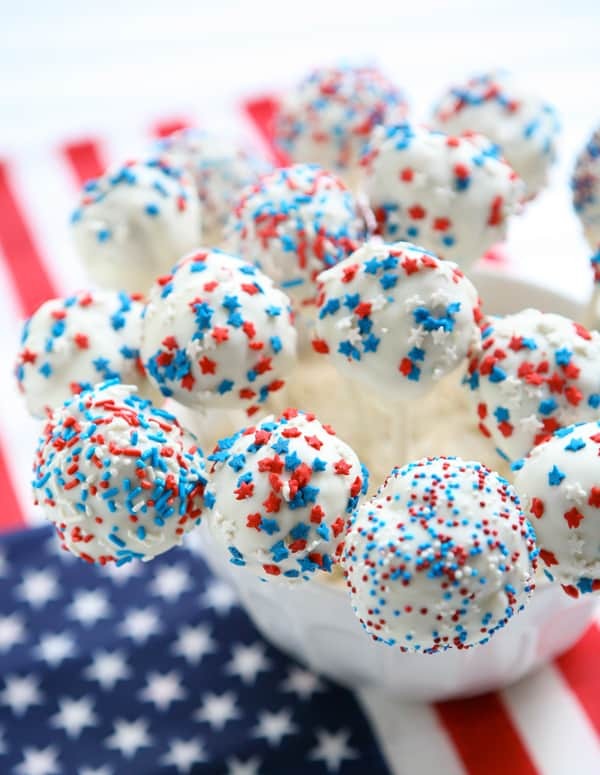 Do you know how many cake pops this recipe makes? Should be 24 for 1 tablespoon size cake pops I believe. These are BEAUTIFUL!! 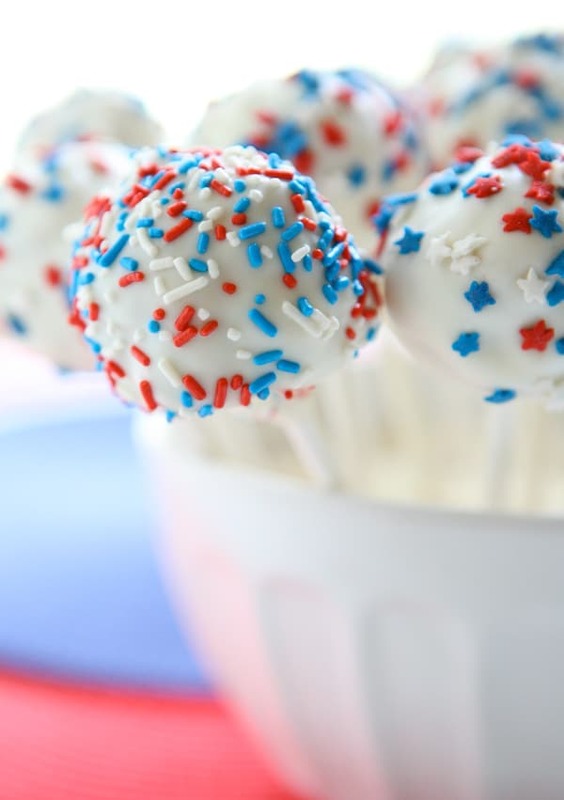 I am making them for Fourth of July! Thanks for the idea!